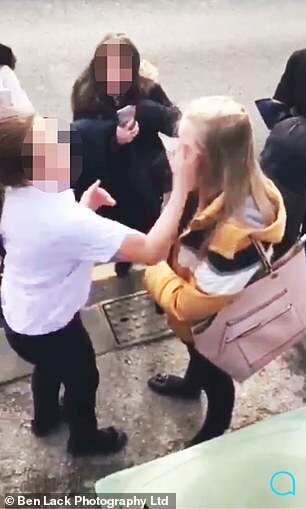 This is the shocking moment a defenceless 12-year-old girl bravely refuses to fight a bully as a teenage crowd screams abuse. The Catholic schoolgirl stands her ground as a teenager slaps her around while classmates film the cruelty on their mobile phones. The victim refuses to strike back during the stand-off after leaving the school where teacher Ann Maguire was infamously stabbed to death by a pupil in 2014. The victim was confronted on the pavement after leaving Corpus Christi College in Leeds, West Yorkshire, by pupils wanting to watch a fight. It is believed to have been pre-arranged by older boys who joke off camera about selling tickets. But despite being encircled by a jeering mob, the girl refuses to raise her hands, even in defence. The bully strips down to her shirt as a classmate holds her blazer, then snarls 'Fight you silly b***h' as the other girl stands with her hands clasped in front of her. Her tormentor bops up and down and rubs her hands together as she prepares to land the first blow. As one yob howls 'Smack her', the bully rams a fist into the girl's face in a vicious boxer's jab. But the other girl, by now furious at not being able to provoke the other girl, continues to pile on the insults but the other girl just stands there and takes it. The school confirmed the incident happened on Monday but it was not outside the school and claimed those involved had been dealt.